Enbridge Gas Distribution came to us with a challenge: consumers could not find trusted, objective information on energy efficiency online. 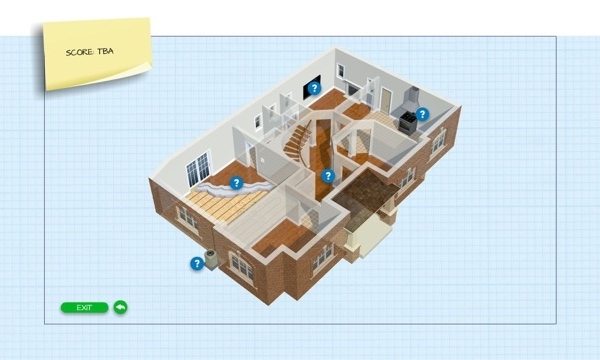 Most of the energy efficiency service design in the market was provided by retailers like Home Depot, and consumers had a bad case of Green-Fatigue. EGD knew that they were a trusted brand but they did not have consumer mind-share in energy efficiency. They had been previously unsuccessful in turning the relatively dry area of energy efficiency into a compelling narrative to ignite interest and urgency in consumers. 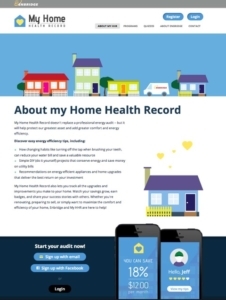 Our solution: A gamified, web-based service design that would allow consumers to perform a self-audit on their home and their habits and learn how they could improve the energy efficiency of their household and save money. We also designed a lead generation tool in the form of an energy efficiency game. The game was playable in an interactive kiosk that Enbridge installed at trade shows and other events. 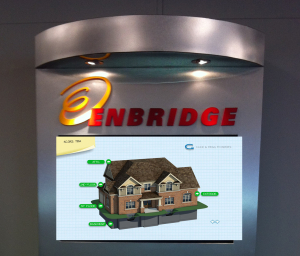 Designed to attract attention at these events, the kiosk was also designed to serve Enbridge contractor partners, allowing them to learn more about Enbridge’s Savings by Design program and to collect emails, providing Enbridge with an email automation process to manage relationships with contractors who signed up, wanting to learn more. We developed the end to end content-as-a-service strategy and all assets: we performed all user research, an audit of business goals, an extensive requirements and wire framing process to development of the application. The biggest technology challenge was creating a game-like interaction that would be fully AODA compliant, while still functioning in Internet Explorer 8. The biggest service design challenge was integrating these digital user-end services into the existing complexity of Enbridge’s services and products. 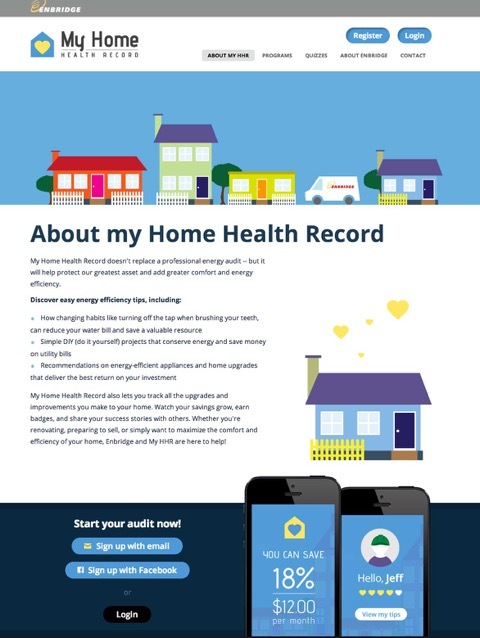 The result: an end-to-end service design consisting of a home energy audit that feels like a game, with a compelling narrative built around the savings inherent in incremental lifestyle changes. Fully AODA compliant, the entire experience can easily be run using only keyboard commands, across all browsers including Internet Explorer 8.